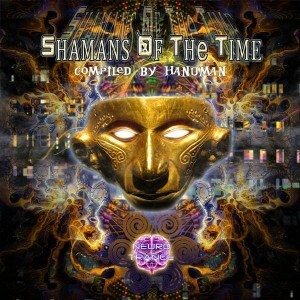 Shamans Of The Time, compiled by Hanuman for Neurotrance Records, joins artists from different places of the world to honour the shamanic sound and connect you with the cosmos through a resounding ritual. Shamans are visionaries and wise people that through entheogenic substances or percussive sound rituals provide a divine experience through mental dissociation and trance. The shaman’s teaching is self-discovery which welcome mystical travel and the capacity of directly perceiving, without a mediator, the aspects of the reality which generally are not perceived by the conscious mind. Mastered by Erofex and Artwork by M.Y. Project. MP3 Download | FLAC Download | WAV Download · Download count: 11,379.
thanks so much this is one of the best forest albums ever!!!!!!!!!! This is some powerful stuff, a lot of ferocity and creative ideas. The production quality is uneven, with some songs sounding like harsh lo-fi FL Studio Psycore, w/ overly trebly kick drums, and others sounding like beautifully compressed/mastered immersive darkpsy with perfect sonic hierarchy. The album would probably be more consistent if it was shortened, but I enjoyed the whole thing. Crooked Mind, Hanuman and Pixie Freak created some real bangers. I enjoy the growing political/social consciousness of darkpsy.